As a farm boy, I had no inkling that watching my Dad work would one day help me understand the biblical role of pastors and church leaders. Our farm had asparagus—23 acres of it. At 5 a.m., from mid-April until roughly the Fourth of July, we began cutting. (No, you do not “pick” asparagus; you pick peaches and other fruit that grows on trees.) The “we” included a crew of 12-15 teenagers Dad had hired to work each morning until time for school. Cutting asparagus does not take a college degree. But it does require some training. New to the crew? Then Dad will help you internalize what five inches looks like. A stalk must reach that minimum height before it passes muster for market. Dad will also equip you to use the asparagus knife—a 12-inch steel rod with a wooden handle on one end and what looks like a slant-nosed putty knife on the other. To make the cut, grasp an asparagus stalk with one hand, aim the blade at an unseen point two inches beneath it under the soil, then push the knife until you can lift the stalk. Once you have handful, lay the stalks crosswise in a row flagged with stakes so the pick-up team can box them. But what does Dad's way with his asparagus crew say about the biblical role of church leaders? As Paul explains it, their responsibility is to “prepare God’s people to serve. If they do, the body of Christ will be built up” (Eph. 4:12, NIrV). The Holy Spirit has given a gift or gifts to each member of Christ’s body. Leaders in the church, like Dad in the asparagus field, should refrain from doing most of the work themselves. Rather, they are to fit out Christ-followers in the use of their gifts, to sharpen their tools, and to equip them for doing the bulk of the work. Please bear with me while I paint a ludicrous word-picture. Suppose my Dad had built, off to one edge of the asparagus field, a set of wooden bleachers. As the high-schoolers show up at sunrise, he hands them files and asks each one to sharpen a knife for him. That done, he points the crew to the stands and invites them to take their seats. Then, with his supply of sharp knives, he starts down first one row then another, harvesting that day’s asparagus crop himself. Of course, he does an expert job—cutting just the right stalks, discarding the culls, and placing each handful neatly in the pick-up rows. What makes this picture so absurd? With Dad trying to do the work himself, most of the day’s harvest will go to seed and be lost. (On a hot day, asparagus stalks can grow by many inches and become cow food.) With 23 acres of asparagus to cut, even a highly competent cutter like Dad would wear himself out and never finish the task. His best investment of time and effort: to make certain each one in the many-membered crew is ready and able to take on his and her share of the work. Play the Game or Coach the Players? Let E. Stanley Jones (changing the analogy from asparagus to sports) relate this to the church. “The laity, on the whole, have been in the stands as spectators, and the clergy have been on the field playing the game. . .. That setup must be changed. 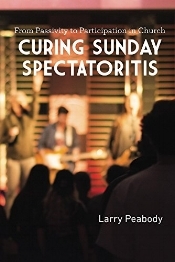 The laity must come out of the stands as spectators and take the field as players; and the clergymen must come off the field as players and take the sidelines as coaches of a team” (from The Reconstruction of the Church—On What Pattern?). Jones wrote those words nearly 50 years ago. But even today, in far too many churches, the pastor and a few musicians still do most of the heavy lifting when we gather. Who “emcees” the Sunday meeting? Who reads Scripture aloud? Who offers the “pastoral prayer”? Who does almost all the preaching? Who always oversees the Lord’s Table? Who baptizes? Who dedicates babies? Who pronounces the benediction? Who chooses the songs? Placing much of this work in the hands of the so-called “laity” does not diminish or downgrade the work of pastors. Rather, it makes their work more productive, as they multiply their influence through others they have coached and equipped. Sian and Stuart Murray Williams call for “multivoiced” (in contrast to “monovoiced”) church. They write: “In healthy multivoiced churches neither the leaders nor the community are disempowered” (from The Power of All: Building a Multivoiced Church). But Are We Willing to Change? Moving toward shared or multivoiced church, though, will require—on the part of both congregations and pastors—a Spirit-empowered willingness to change. Those long comfortable in the bleachers watching someone else perform must find the resolve to get up and stir their gifts into action. Pastors, after perhaps years of being in near-total control during Sunday meetings, will need to trust the Holy Spirit to work through others who are gifted and prepared. With a bit of imagination and a resolve to provide the needed coaching and tools, pastors and church leaders can find ways to empower those in the congregation to: preside over Sunday gatherings, pray publicly, tell how God is working in their scattered-church lives, share in the preaching and teaching, baptize, lead during the Lord’s Supper, and more. Paul describes all this so well: “As each part [of Christ’s body] does its own special work, it helps the other parts grow, so that the whole body is healthy and growing and full of love” (Eph. 4:16, NLT). When each part is enabled to do its work for the rest of the body, we will discover how to connect our faith with our voices. If in our gathering together we do not learn how to voice a witness to each other, how can we expect in our scattering to voice a witness to the world?